Released yesterday, data from the Australian Bureau of Statistics indicates that the weighted average price of dwellings throughout Australia’s eight capital cities fell by 2.4 percent during the December quarter and by 5.1 percent last year. The average (mean) price of all dwellings is now $651,100. Eastern seaboard capitals are leading the decline. House prices in Sydney, Melbourne and Brisbane dropped by 3.7 percent, 2.4 percent and 1.1 percent respectively during the quarter. 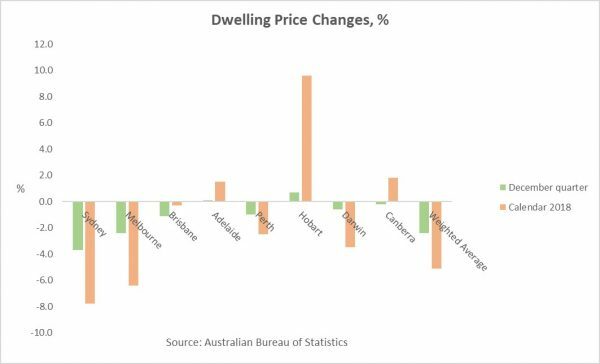 Over the year, prices fell 7.6 percent in Sydney and 6.4 percent in Melbourne. Bucking the trend is Hobart, where prices rose 0.7 percent in the quarter and 9.6 percent for the year. ABS Chief Economist Bruce Hockman said the decline in prices across Sydney and Melbourne follow years of growth which saw values over the five years to December 2017 rise by 68 percent in Sydney and 54 percent in Melbourne. He said these markets are being impacted by tighter credit supply and falling demand. “While property prices are falling in most capital cities, a tightening in credit supply and reduced demand from investors and owner occupiers have had a more pronounced effect on the larger property markets of Sydney and Melbourne,” Hockman said. All up, the value of Australia’s 10.3 million residential dwellings fell by $133.1 billion during the quarter and now stands at $6.7 trillion.